Perhaps it’s an Irish thing, but I’ve always found rain very beautiful. It’s refreshing and cleansing, it brings rainbows and solidarity under umbrellas. It’s just such a pity it had to be so, well, wet. The people at Random International seemed to be thinking the same thing- in a temporary installation at The Barbican; they’ve created a downpour that you can walk through and remain bone dry. The Rain Room, around until March, is about ten metres squared with a sieve-like roof letting drops of water in, giving the feeling of an almighty downpour. The genius is in hundreds of sensors on the roof that detect where you are standing and switch off the water directly above, meaning you’ll be right in the middle of it all and never get wet, even as you walk around the room. It’s a really surreal experience. The first step in is the weirdest, requiring quite a leap of faith as you walk into a near- certain soaking. But with less than an inch between you and the rain left, it starts to move away. It’s an incredible thing to watch this wall of water wrap neatly around your hand as you move it, a sense of control and power. This must be what Moses felt like while parting the Red Sea, or something. The desire to understand, predict and control the weather is one of the most basic human instincts. It’s also the most elusive. Even today, we can only look on in horror as hurricane Sandy devastates much of the United States and the Caribbean. 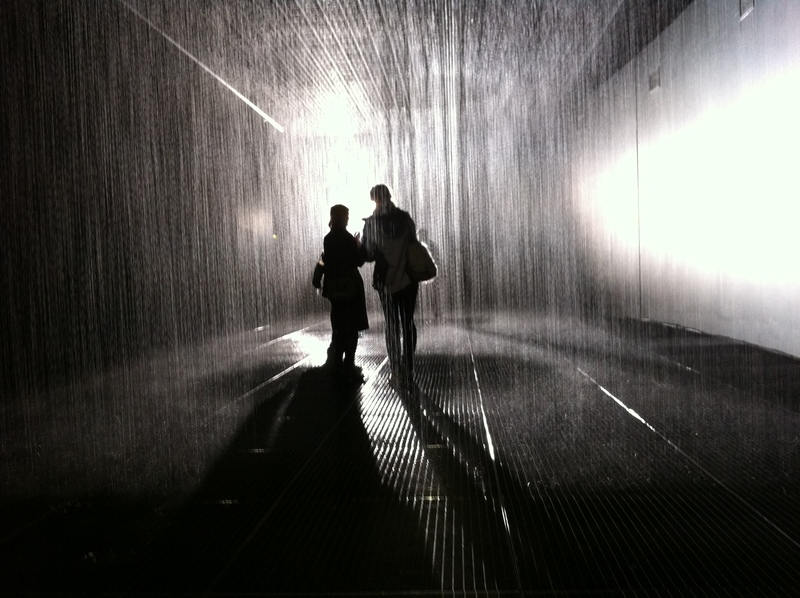 This must account for something of the appeal of The Rain Room; the chance to control the rain, albeit artificial rain; to experience the rain without the inconvenience of getting wet. I know this sounds pretentious as hell but if we don’t get wet, are we really experiencing the rain? Standing in The Rain Room, the initial feeling of control gave way to an eerie sense of detachment, of being an observer rather than a participant. You would reach out to touch the rain and it would retreat back, a metaphor, perhaps, for Man’s own estrangement from the natural world. One thing for sure is the Room is thought provoking and, with a minimum two hour queue, very popular. Whatever the room makes you feel, it will be worth the wait. Watch a video of my Rain Room experience here!